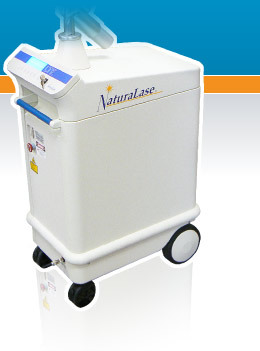 The award winning NaturaLase Er is an Erbium laser designed for ablative skin rejuvenation. With 3000 mJ per pulse this laser delivers the highest pulse energy in the aesthetic industry. Its high energy and resulting large spot size (up to 10 mm) result in more comfort for the patient, and improved ease of use for the physician. Erbium wrinkle treatments make a dramatic difference for the patient. One treatment provides striking results removing wrinkles and replacing sun damaged skin with soft new skin. Focus Medical, a pioneer in Erbium skin resurfacing technology, offers its latest generation resurfacing laser - The NaturaLase Er Erbium Laser System. The NaturaLase Er is ideal to remove superficial lesions and pigmented lesions and has the power to ablate thick or deep lesions as well. The NaturaLase Er is the highest power Er:YAG available. With 3 Joules per pulse and up to a 10mm spot size the specs are without comparison. High power allows for the versatility a physician needs to provide a wide range of treatments to a wide range of patients. Anywhere from a light "Weekend Peel" to a face lift type procedure, the NaturaLase Er will help you succeed. The NaturaLase Er now includes fractionation. A new hand piece produces a fractionated output that maximizes collagenesis and reduces patient down time. The flexibility to do traditional ablative resurfacing or fractional ablative rejuvenation provides the options needed to satisfy a wide range of patient expectations.